Home / Caribbean Project / Mining The Lead Pile and Finding Fun! Comments Off on Mining The Lead Pile and Finding Fun! 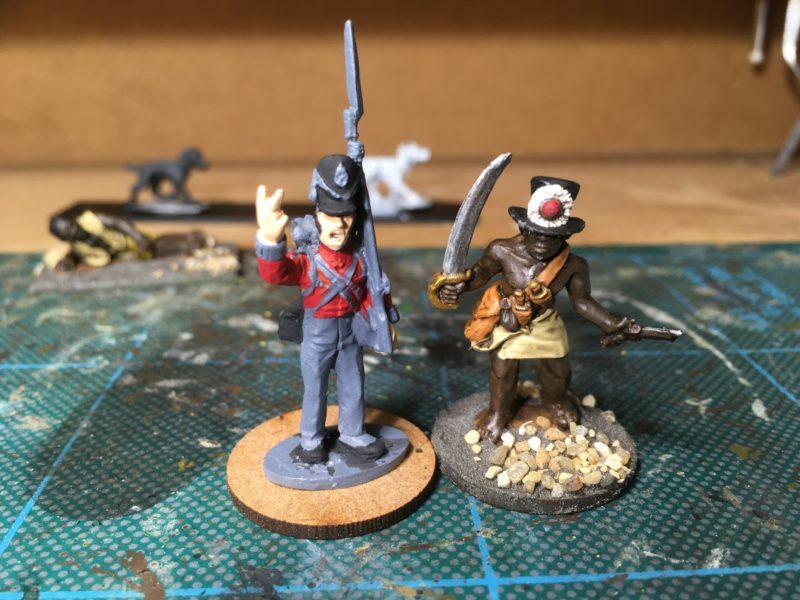 Caribbean Project, Napoleonic Army, Whats on the work bench? 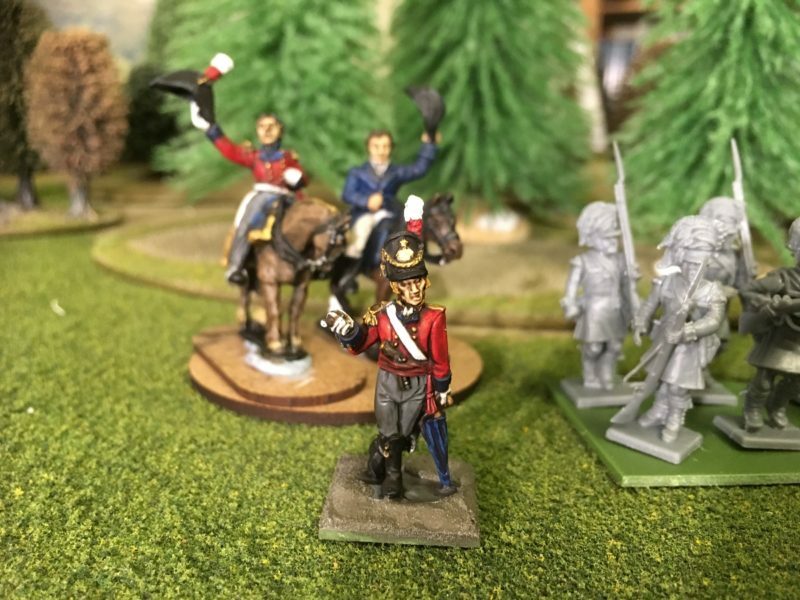 I started the New Year with a post entitled ‘Bitting and Bobbing’ which is a fair assessment of how my modelling has continued so far this month. 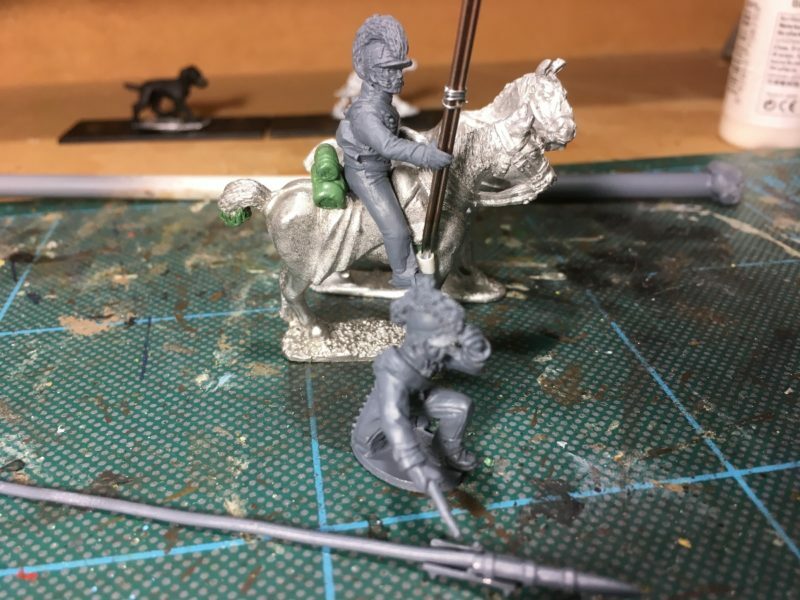 In the last fortnight I have gradually been working through some unfinished units and figures that have been at the side of the work bench for some time. A good example being my battalion of Nassau Infantry that were finished last February but were languishing without a flag. Well the flag is now added and I think I’ve got it the right way up…. 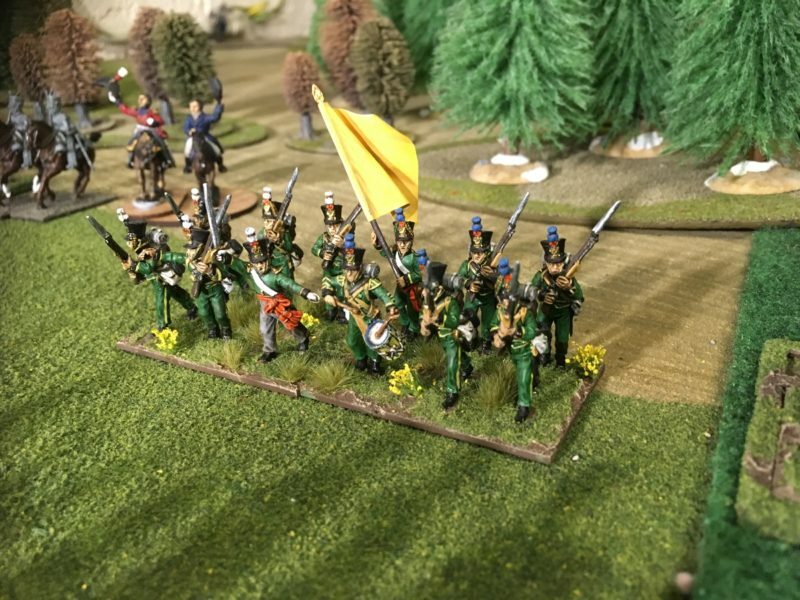 Nassau Infantry at last have their flag! 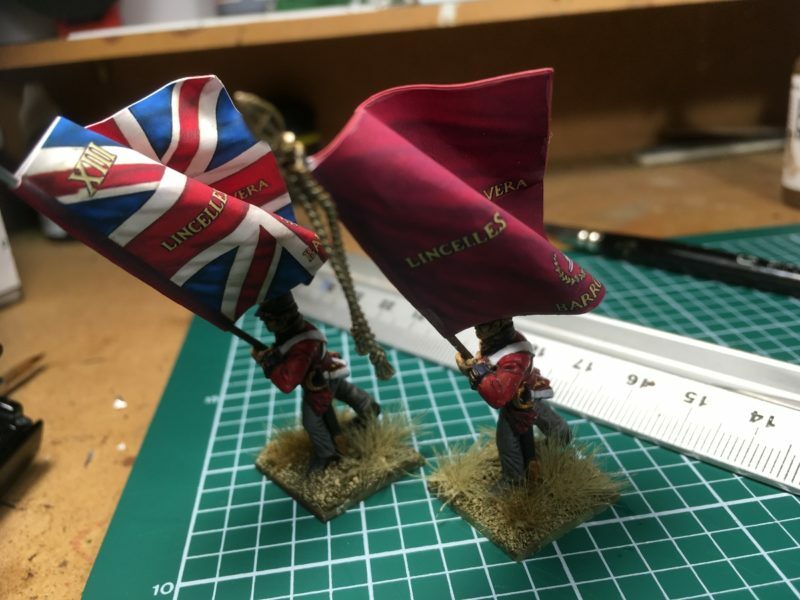 Talking of flags, I decided to ‘reflag’ my Battalion of Coldstream Guards. They actually did have flags but I was unhappy with the quality. I had bought the original flags at a show but with hind sight they were oversized and badly printed on glossy paper and nowhere near as good as the GMB flags that I normally use. So they have now been replaced with GMB printed flags which are a much better size and a much better colour and quality. New Flags for the Guards! I have also been working my way through some officer figures. This fellow was a limited edition from Warlord, I think, so although not quite finished ( the basing needs to be completed) he is almost ready to join his Regiment. New Officer – just the basing to complete and a bit of a tidy up. I am gradually assembling the two Battalions of Highlanders, the 42nd and 92nd Battalions. I have one Battalion of 24 assembled and have started on the next battalion. Once I have them all assembled, I’ll start the challenging task of painting them but I am in no rush to start! 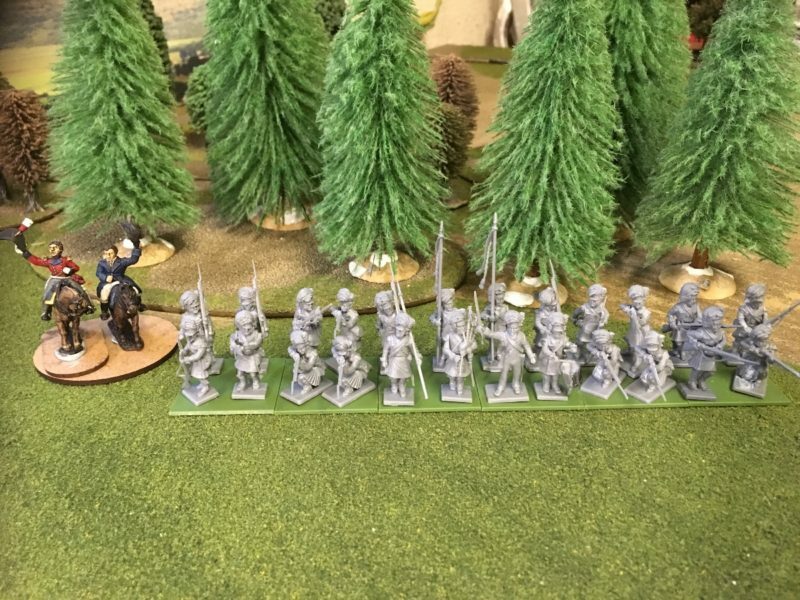 Incidentally, the trees behind the figures are from a Garden Centre – it may be too late now but I recommend checking out the sale section in your local Garden Centre, there are bargains to be had for wargamers! 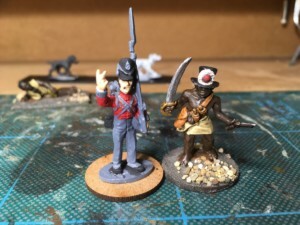 In my previous blog, you may have noticed a random Caribbean Maroon figure on the work bench. 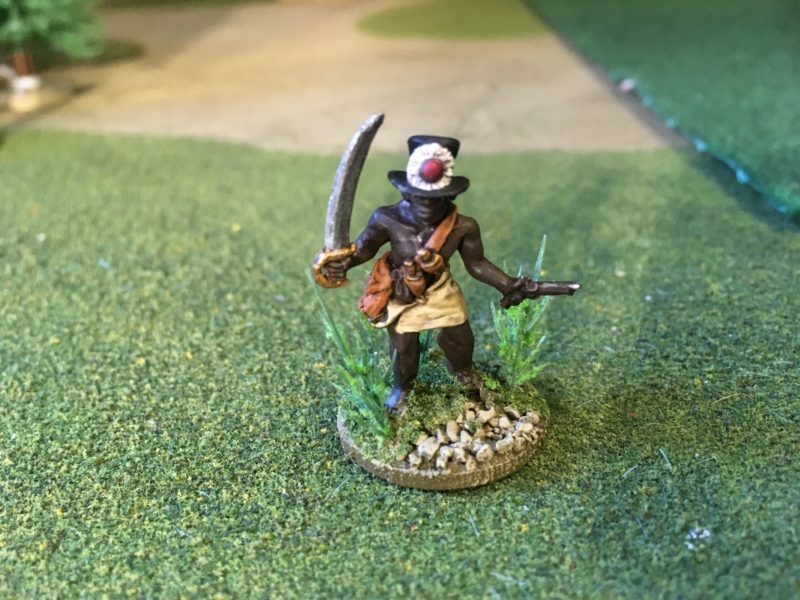 I have actually painted him before but somehow he has gone AWOL from my cabinet, so I decided to replace to re- complete my set of Trent Miniatures Caribbean rebels and Maroons. 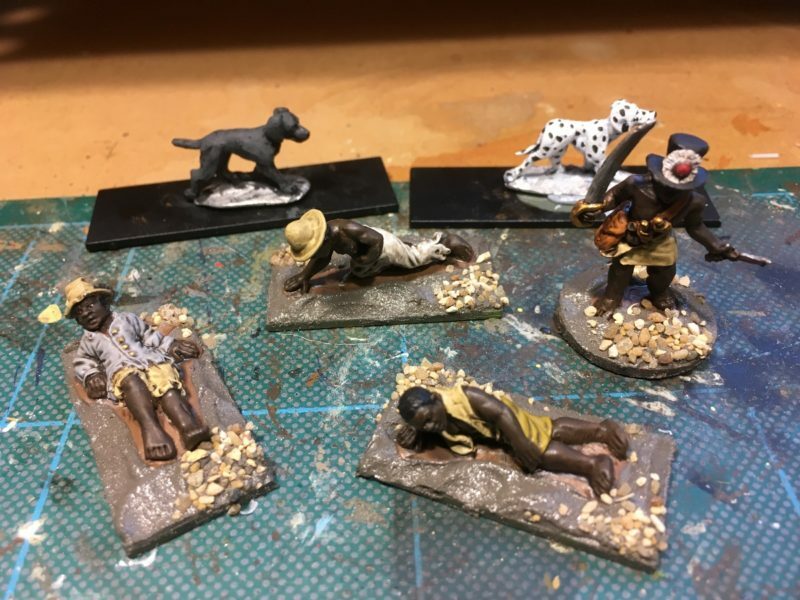 Out of the blue, Duncan, of Trent Miniatures, announced that he had released new pack of Caribbean casualties so I grabbed a pack and finished them all in one batch. My Caribbean collection is now complete for the time being! 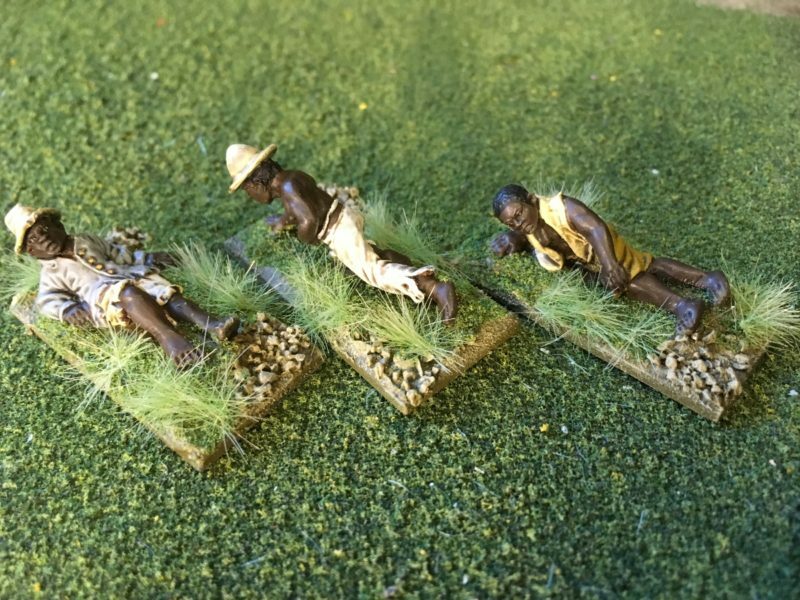 Caribbean casualties in progress – basing about finished. Maroon leader – replacement complete! I have long admired the Warlord British Napoleonic Rocketeer and had added it to my unpainted figure ‘collection’. It was one of those figures that I intended to do something with but I wasn’t quite sure what. Well with my new found carefree approach to my painting projects, I decided to get on and paint him as well as converting a horse holder to go with him. I’ll detail how I made the companion in a future blog but here is a picture of the work in progress. I have a version of this cheeky figure already. As you can see, he’s still a W.I.P. although since writing this blog he is nearly ready to join his officer. I’m not sure whether to make another small vignette with him, an officer and a DeeZee dog (you can see I have two versions of DeeZee dogs that are being worked on in some of the other pictures) or whether to put together a battalion of odds and ends and spare figures just for fun. It’s the latter option that appeals to me at the moment. I seem to accumulate random figures from friends, so it might be fun to have a battalion of characters and misfits. And there’s more…well actually, there isn’t but I have just re-read ‘Sharpes Tiger’ by Bernard Cornwell. Once again, I am reminded that history doesn’t have to be a dry subject and with a bit of imagination it can be exciting and fun. I know that some find the ‘facts’ and detail the most important part of the hobby but if you are not careful, the pursuit of absolute accuracy can result in nothing ever being finished. The more I read, the more I am convinced that we really dont know half of what went on, so why get too hung up on micro details? A thought that I will return to in my next blog. However you choose to make and paint your models, I hope that you have fun and enjoy yourself and if we can help at Arcane Scenery, please drop me a note.